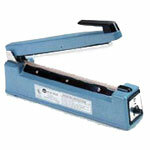 A foot sealer is a type of bag sealer that uses heat to close plastic bags. 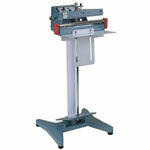 A foot sealer offers the benefit of allowing the user to work with both hands free to handle the product. 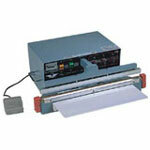 This effectively increases the productivity of the user allowing for higher volumes of production. 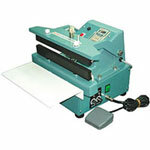 A standard impulse sealer will close a plastic bag up to 6 mil thick. Another rule of thumb is to purchase a sealer that is 2 inches larger than the widest bag that needs to be heat sealed. The one inch extra on each side of the bag allows for strong seals and faster operations. Both 2 millimeter and 5 millimeter sealing widths are available for these type of foot sealers. This foot sealer comes equipped with a foot pedal activator in addition to a pedestal, stand, adjustable worktable and foot pedal. 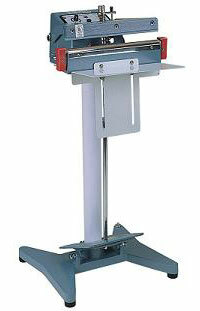 Boatman Marking offers a wide variety of impulse sealers for a full spectrum of packaging needs.